NEW YORK, NY / ACCESSWIRE / November 12, 2018 / Kuende is the only social media app that rewards you for participating in real-life activities with your friends. 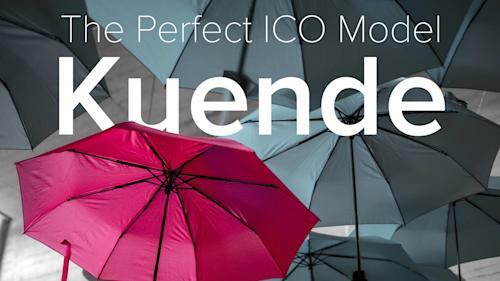 While traditional ICOs seem to be stumbling and raising less in a bear market, one ICO called Kuende seems to be moving forward with no problems. Within two days of opening up its public sale, it raised more than 11,000 ETH. There is no doubt, Kuende seems to have found the key to making an ICO work, and other projects have taken notice. We believe that it's a combination of a few factors: its partnerships, its community engagement, and some new innovative business practices. ICOs have begun to adopt the Kuende model of marketing its token, so let's take a look at this case study of what has made Kuende so successful thus far. CEO Pavel Antohe brags about the partnerships that he's gotten over the past year. Promising that Kuende will be the premier social media app on the first blockchain phone, the FINNEY, was one of the bigger announcements made. ''We're better together,'' he frequently says in his Medium publications and at one point he says he is ''obsessed'' with working with other projects. The emphasis on partnerships with established businesses is important, especially in a time where people are more and more skeptical of ICOs. Kuende's strategy seems to be working because Kuende is connected to many of the biggest blockchain projects out there. An integration with COSMOS, the ''internet of blockchain'' means that where people look to be social in regards to the blockchain, Kuende will be there. Because engaging the blockchain community as a whole is important, Kuende also partnered with IPSX and BountyHive. Kuende recently partnered with Forbole, ensuring that it will be able to scale as Generation Z and Millennials start moving off of traditional social media to something more engaging. Part of the partnership also looks to focus on educating the blockchain community at large. Kuende is a social media app, so it makes sense that its team would be focused on community engagement. The team took it a step further by having multiple members handle its Telegram and social media aspects. Instead of just posting product updates, it would post funny photos, historical dates, and it would create stickers for community members to use on their social media apps. CEO Pavel Antohe believes that the only way for cryptocurrency and blockchain to move forward is to unite the community and to continually provide them with new information and content. To this end, Kuende is also a frequent poster on Medium, detailing its new partnerships, its product updates, reasons for checking it out, and other topics. Very few projects ever go the length of really involving communities in the nuts and bolts of the process. There are frequent posts on its Telegram with community members discussing the new articles as well as their excitement. In an age of ambiguity, it is nice to have a company that is being fully transparent. Some could even interpret it as a shot fired at the monolithic tech companies that lack the same free spirit. A bounty program promising a trip to Romania and 5 ETH to the top bounty hunter? Partnering with other blockchain projects to develop new business models? All of this and more came from Kuende. Ad campaigns today tend to be invasive to the user or just show passively on social media. This would be the first time in an app where businesses can incentivize users to do something physically. Because the users are also rewarded, they have a form of direct reward rather than just being marketed to on whatever social platform they use. Businesses can rest easy knowing that they are cultivating an active audience that is tied to their brand name when they create challenges. Perhaps what has set Kuende the most apart from other ICOs is that CEO Pavel Antohe first sought out traditional investment before going to create an ICO. By first focusing on infrastructure and gaining traction for its platform, Antohe created an attractive prospect for those looking to turn their ETH into something more valuable. There is an image regarding ICOs that went viral regarding how most projects are funded on simply an idea, with the finished project being a shadow of the idea. Kuende turned this upside down with an almost-finished project, just needing funds to boost and scale.